Tim Caverly has spent his life in Maine’s outdoors. Growing up shadowing his father, who was a fire warden with the Maine Forest Service,and his brother, a ranger in Baxter State Park, it was natural for him to seek a career in the outdoors. Tim will share his experiences in the outdoors Sunday, Feb.9 at 2 p.m. at Taylor Community’s Woodside Building, 435 Union Ave. The event is free and open to the public, but please RSVP by calling 524-5600, Monday through Friday between 8 a.m. and 4 p.m. or email, rsvp@taylorcommunity.org. Originally from Skowhegan, Maine, Tim began working as a ranger at Sebago Lake State Park while in college. 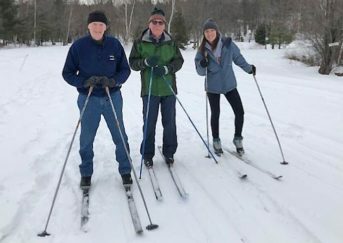 Afterward, he continued his employment with the Department of Conservation with assignments as manager o fAroostook and Cobscook Bay State Parks, as well as being a regional supervisor of the Allagash Region. This Region included the Allagash Wilderness Waterway and Penobscot River Corridor. He was supervisor of the Allagash Wilderness Waterway for 18 years. In 1999, Tim retired from the Department after a 32-yearcareer. He resides in Millinocket, and worked for five years in the Millinocket School System. He now writes and presents programs full-time throughout New England, enjoys raising Golden Retrievers and sharing stories about the Maine woods.